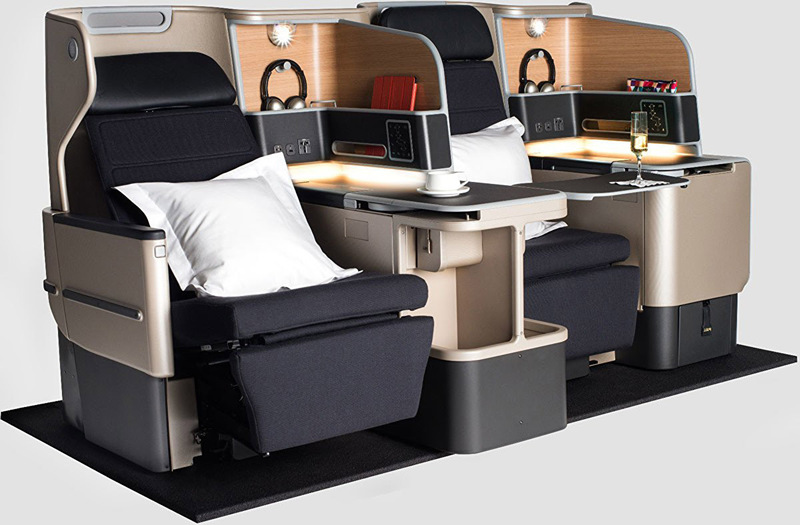 Qantas set a new benchmark for domestic business class travel in 2014 when it launched the ‘Business Suite’ on its refurbished A330s. 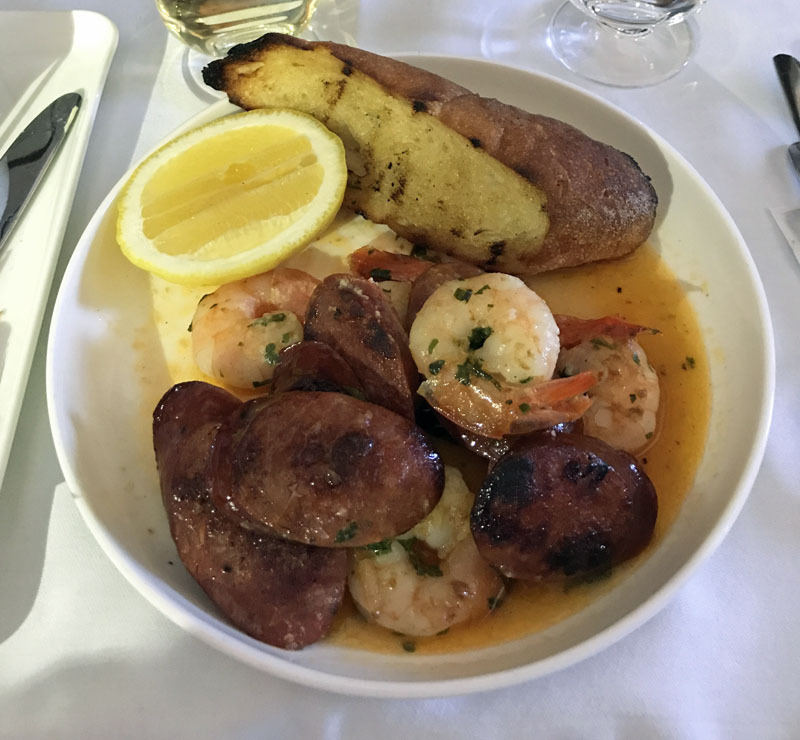 I often fly between Perth and Melbourne in the Business Suite and, when it’s coupled with good meals and service (as it usually is), it’s a fantastic experience in the air. 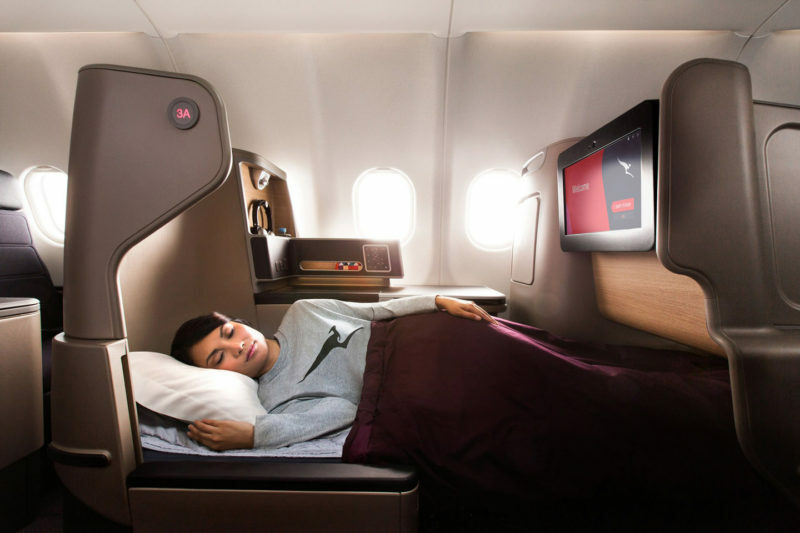 Upgrading or booking an award seat outright to enjoy the Business Suite is a great use of Qantas Points, especially on longer domestic flights. I usually buy the cheapest red-e-deal fare (about $200) and upgrade for 25,000 points, though on my most recent flight I used purchased American Airlines AAdvantage miles to book the seat, which cost about $500. 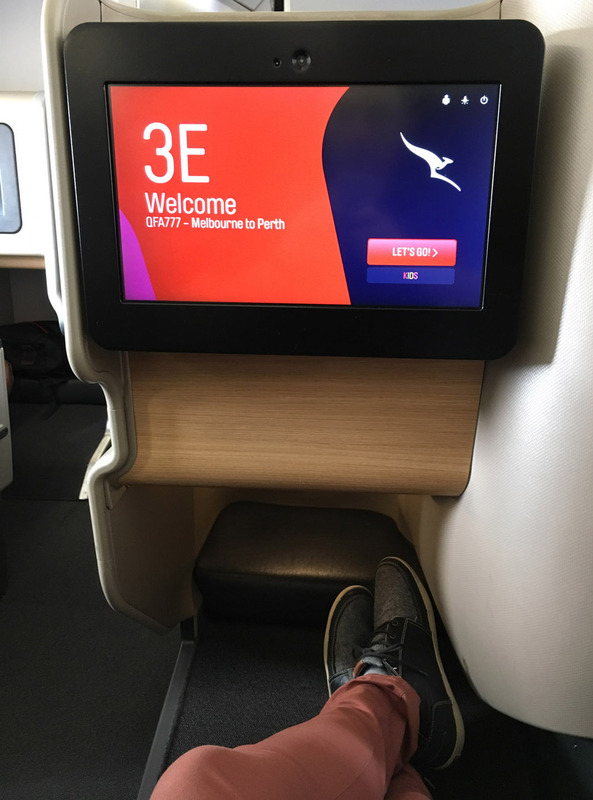 Here are the highlights of my recent Perth-Melbourne flight, and what you can expect if you fly in the Business Suite. Domestic business class passengers always have lounge access prior to departure. 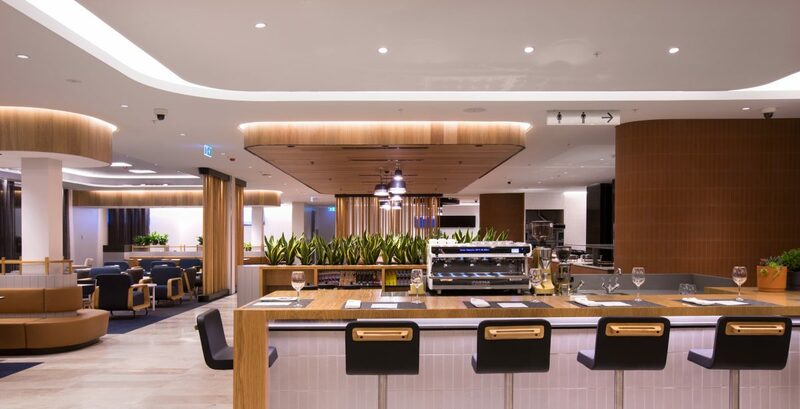 At major airports, Qantas operates a separate business lounge to the Qantas Club, but in smaller locations there’s usually just a Qantas Club for everyone. The two standout business lounges in Qantas’ domestic network are in Brisbane and Perth. Both were refurbished recently and offer great seating, drinks and food (including fresh pizza in Perth and Mexican in Brisbane). Melbourne is reportedly the next city to get a lounge a refresh, due in 2018. The Business Suite is spacious and comfortable and can be easily reclined into various positions, including fully lie-flat. They’re arranged in a 1-2-1 layout, with every passenger getting direct aisle access. There’s lots of storage space for laptops, books, shoes, drinks and other personal items, and AC power and USB ports for your gadgets. There’s also plenty of leg room (of course) and an ottoman / foot rest that provides extra space when fully reclined. Unfortunately, the divider between the middle two seats doesn’t retract and isn’t couple friendly, but hopefully you’ll be enjoying yourself too much to worry about your partner (and Qantas is rectifying this issue in the next generation of the Business Suite, which will be featured on the new Dreamliners). Customer service can make or break your experience in the air, and I find Qantas’ service to be consistently top-notch. On my most recent flight, I was greeted as soon as I boarded and the team provided friendly and attentive service throughout the journey (as is usually the case). 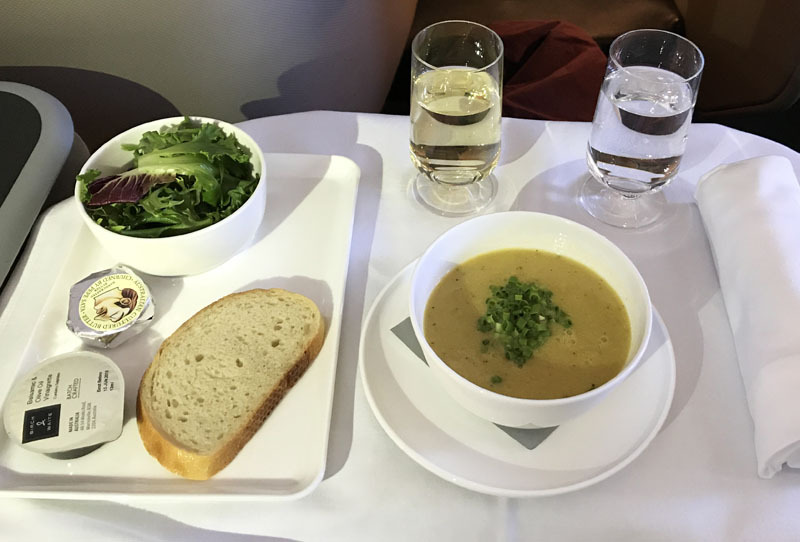 Highlights included a fast and efficient food and drink service, free flowing wine and other beverages throughout the flight, and an all-round friendly and positive attitude. 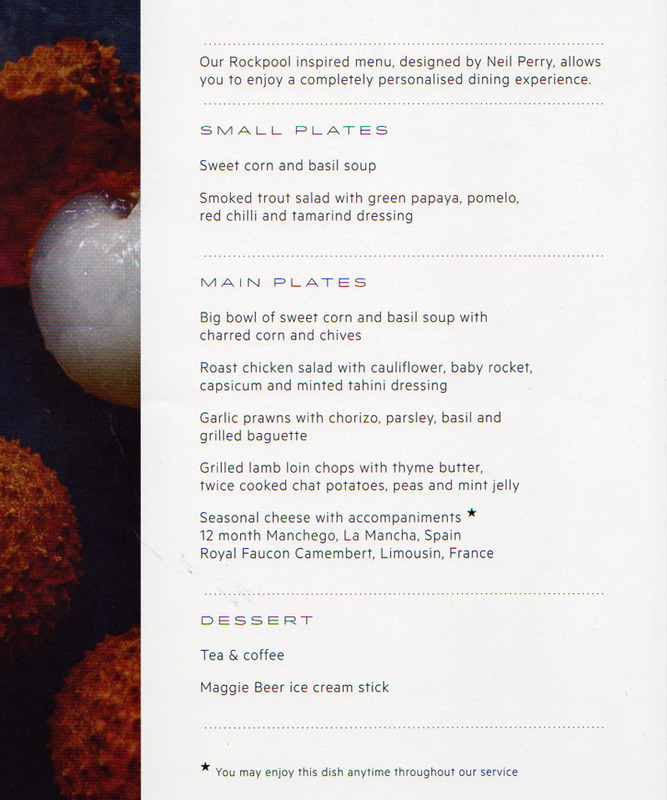 Qantas provides good quality food and drinks in business class on domestic flights. Shortly after take-off, a full drink service begins, typically with two white wines, a red and a sparkling choice, as well as beer, spirits and non-alcoholic options. Sometimes it takes a while for the drinks service to begin – anywhere between 15 and 45 minutes in my experience – and I’ve never been able to figure out why! Shortly after the drinks are served, a crew member will come around to take food orders from the ‘Neil Perry inspired’ menu. Here’s the menu from my most recent flight. To start with, I chose the sweet corn and basil soup, which wasn’t as enjoyable as the soups I’ve had previously. The consistency was a bit strange and it tasted a bit bland. Normally, the soups are great! For my main, I chose the prawns and chorizo. This was a nice contrast to the starter, with lots of flavour and just the right amount of chilli. The grilled baguette didn’t taste the freshest, though. Qantas doesn’t provide big desserts and this time around the crew offered a Maggie Beer ice cream stick, which was delicious. A cheese and fruit plate was also available along with fresh fruit and dessert wines. What I like most about the entertainment system on the A330s is the large 16-inch LCD screen. It’s a great way to enjoy the visual effects of contemporary movies and TV shows. I forgot to take a photo of the films on my recent flight, so here’s one from 2016! Also on hand are Qantas-branded noise-cancelling headphones, though I prefer to use my own trusted Bose set. 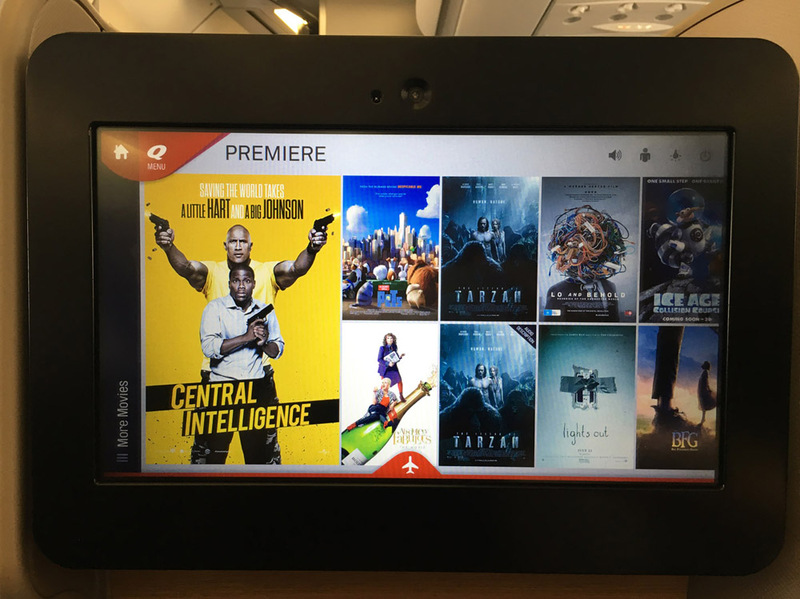 Qantas seems to have improved the range of movies on offer. It used to bug me how few choices there were, but this time there was a noticeably larger selection of films (around 20 I think). Of course, there are other entertainment options including TV shows and music. 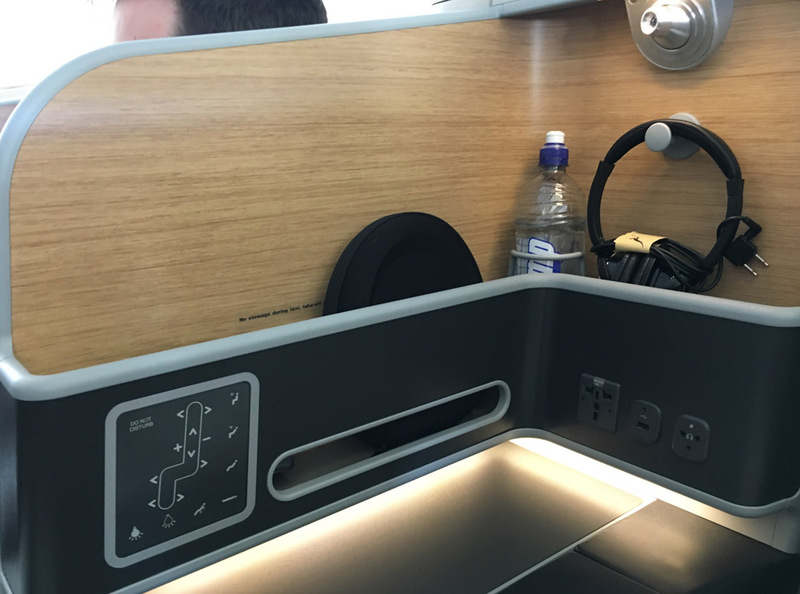 I really enjoyed my latest flight in the Business Suite, as I almost always do. The seat and customer service were excellent, and the food and drinks good – though not as good as on previous flights (hopefully this is a one-off aberration!). I appreciate the high quality experience Qantas consistently provides to its domestic business class passengers. It’s miles ahead of what people get in other countries. I would definitely recommend this is as a great use of Qantas points or purchased AAdvantage miles. 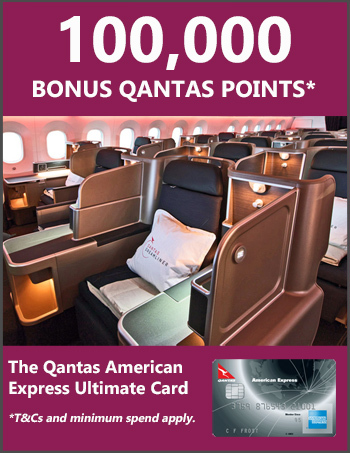 If you’re looking to supercharge your Qantas Points balance, check out the current credit card offers here.